Australia’s economy looks to have experienced its weakest start to a year since 2011 – narrowly skirting a contraction – as a growing consumer spending strike and a cyclone-driven slowdown in exports weighs on activity just as the government bets its budget strategy on a rebound. While the country is not at risk just yet of a technical recession – or two quarters of consecutive declines in gross domestic product – the economy looks set to continue in 2017 its whip-saw pattern of the past year. Combined with weak spending and a fall in shipments of iron ore and coal, as well as lower commodity prices, the first quarter is likely to have been weighed down by a sudden collapse in construction work – a sign that a regulatory squeeze on apartment lending may be starting to bite. Weak retail spending, which this week saw the seventh retailer go under in recent months, sharply rising car loan delinquencies and falling new car sales all point toward a population clamping down on discretionary spending. ANZ Bank economists said next month’s national accounts may show the economy grew just 0.1 per cent from the December quarter – raising the spectre of the second negative quarter in nine months after GDP shrank by 0.5 per cent in the September quarter before rebounding by 1.1 per cent in late 2016. Mr Thorburn said his cautious optimism about the economy had given way to worries about complacency in the face of massive disruption to workplaces from a technology revolution. He warned that job displacement as a result of technology such as robotics and driverless cars posed one of the major challenges for the nation over the next five to 10 years. …He likened the 25 years since the last recession in the early 1990s to a winning streak that had to come to an end at some point. His comments come as investment bank JPMorgan estimates heavily indebted consumers face an extra $7 billion in costs as banks respond to regulatory concerns by raising interest rates out of cycle from moves in official cash rates. This is likely to put an additional strain on discretionary spending among consumers. The local arm of British fashion chain Topshop Topman went into administration this week, joining a string of recent retail failures including Herringbone, Rhodes & Beckett, David Lawrence and Payless shoes that highlighted weak spending and a shift to online shopping. Listed car retailers AP Eagers and Automotive Holdings both downgraded earnings guidance this week, citing tighter credit conditions and slowing sales on the east coast. …A potential downturn in house prices, residential construction and discretionary spending could spell bad news for the local economy. AMP Capital chief economist Shane Oliver yesterday called a peak on residential property price growth in Sydney and Melbourne because of rising “negative news”. Dr Oliver pointed to surging unit supply, bank interest rate rises, tightening lending standards, reduced property investor tax deductions and ever tighter restrictions around foreign buyers. “Our view remains that home price growth has peaked in Sydney and Melbourne and that price declines lie ahead, particularly for units,” he said. 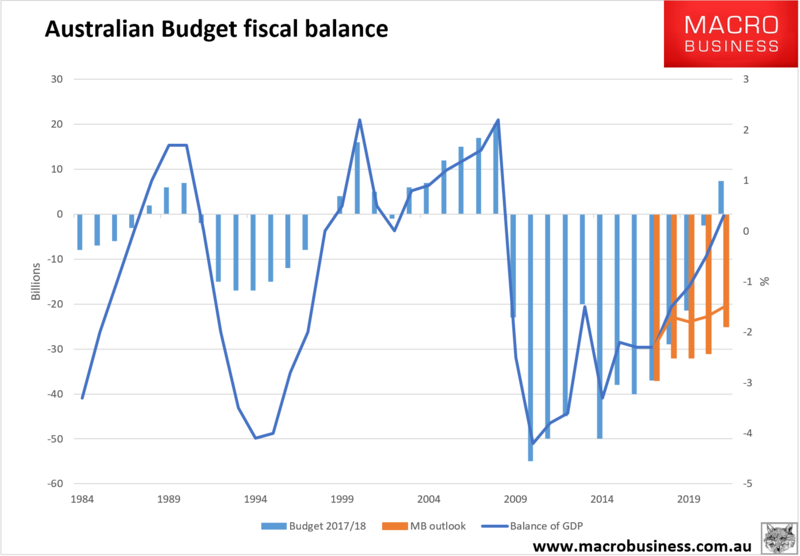 The risk of Australia already being in technical recession should not be discounted though it’s more of an academic, political and psychological question than an economic one. Q1 GDP was not hit much by the QLD cyclone. Nearly all of that will fall into Q2 with the big hit to coal exports from April. 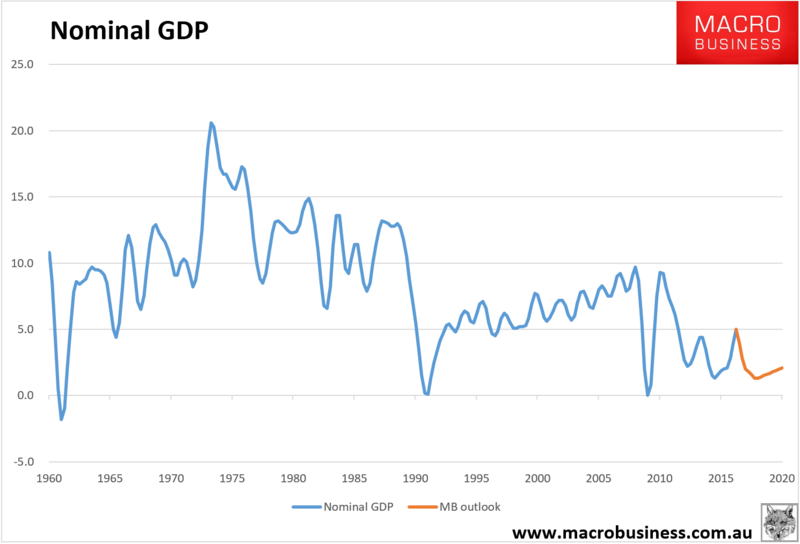 The last time that happened in 2011 GDP collapsed. The risk to Q1 growth is the Pilbara wet which saw iron ore volumes plunge 10% quarter on quarter. There were also some LNG disruptions as Gorgon struggled to ramp up. Hence there will be big weather-related hits to both Q1 and Q2 GDP (though they will give back in Q3 and Q4) via falling net exports that could register a technical recession amid clearly weak domestic demand. It would be an immense relief, frankly, to get the monkey off our back, as well as a near-fatal political blow to the Coalition and a further headwind for confidence. But it’s neither here nor there in terms of the real economic problems coming down the pipe. The ASX will correct with them. In early 2016, the ASX200 was 1000 points lower than today as mining profits crashed and banks priced for the flow through of bad loans. a reversal of the agri-boom that supported GDP volumes in 2016. Then you have to add rocketing political risk as the Coalition’s fortunes crash, it mulls new leaders and immigration cuts, as well as ongoing prudential tightening for house prices which may have already been enough to trigger house price falls ahead. Supports will include more rate cuts, a lower currency, more LNG volume growth and ongoing fiscal deficits. Whether that is enough to keep Australia out of technical recession is a moot question. Either way, unemployment is going to rise and income fall and things get much tougher. But not even all of this is the biggest problem. That comes with the next global shock, whether from Chinese deleveraging, US tightening or some other source some time in the next year or two, just as we’ve exhausted every policy support in the arsenal coping with our own bust. That’s the tipping point for rising external interest rates to crash upon an already deflating housing bubble. 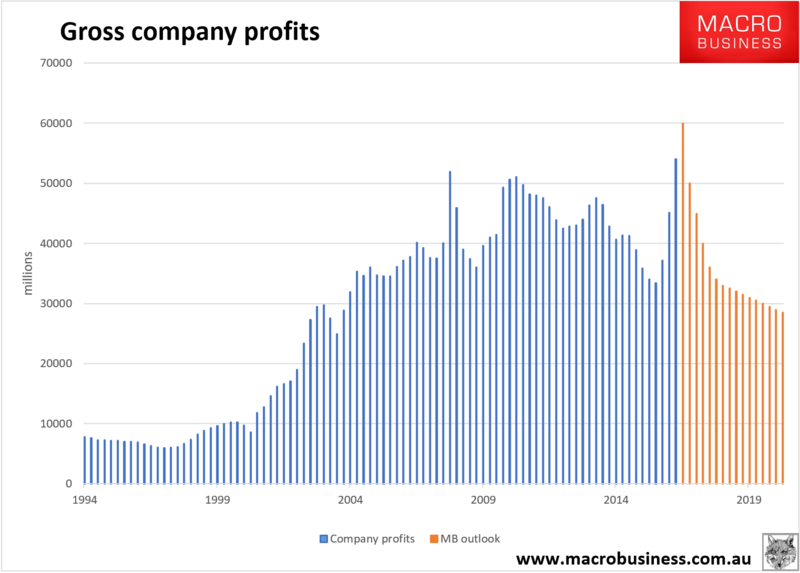 Ever since 2011, MB has warned of rising recession risks as the terms of trade shock began. These have been held at bay by round after round at the housing casino, extraordinary Chinese policy errors, and destructive levels of immigration. 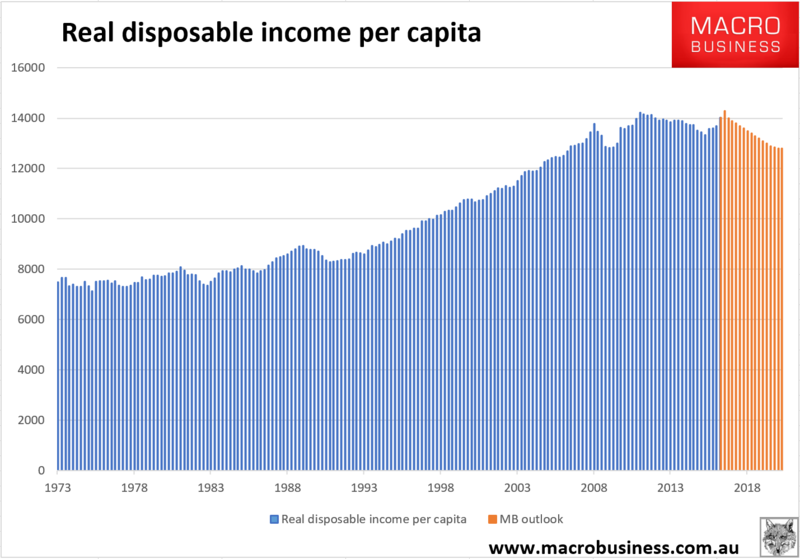 Even so, the period was marked by rising unemployment and collapsing income growth which has put a sizable dent in standards of living while exacerbating already huge imbalances in household debt and infrastructure deficits. 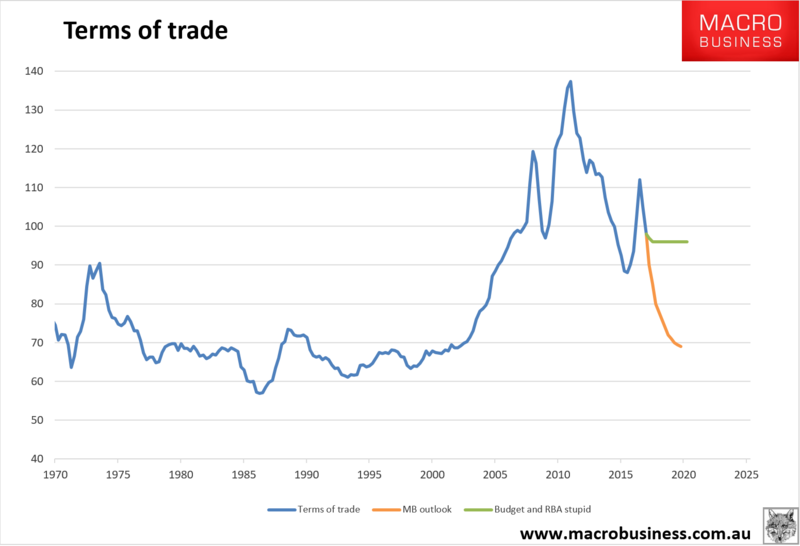 The period ahead will now have to deal with the second half of the mining bust plus the unwind of those imbalances.